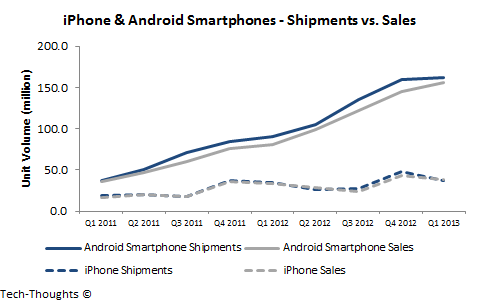 The tech media has long been obsessed with the semantic differences between smartphone shipments and sales. In reality, all figures announced by companies, and those announced by IDC, are shipments (also known as channel sales or sell-in). Gartner is the only research house that tracks sales to end users (also known as sell-through). Comparing data from IDC and Gartner can give us good insight into channel inventory patterns across different smartphone platforms. This data suggests that Nokia & Windows Phone may be in for some trouble in the next few quarters. The chart above shows the % of unsold inventory for each platform. The patterns are fairly predictable for Android and the iPhone. Android smartphones are sold across various price levels and from a wide variety of OEMs. As a result, inventory levels are fairly consistent at ~10% of shipments. On the other hand, iPhone demand is highly cyclical based on product launches. As the result, the inventory pattern is highly cyclical as well, typically peaking around the time of a launch. The interesting data points are from Windows Phone: Windows Phone devices are only available from a handful of OEMs (Nokia is said to be responsible for 80% of shipments), and based on the ASP, most buyers are first-time or mid-range smartphone users. Therefore, product launches shouldn't have an out-sized influence on inventory levels. 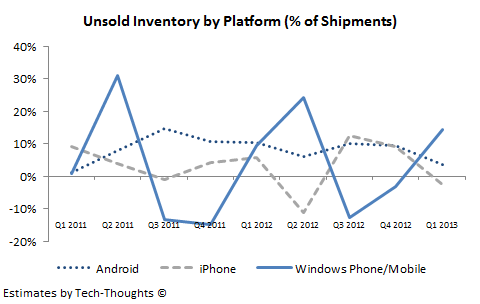 However, Windows Phone's inventory levels seem to be even more cyclical than the iPhone. 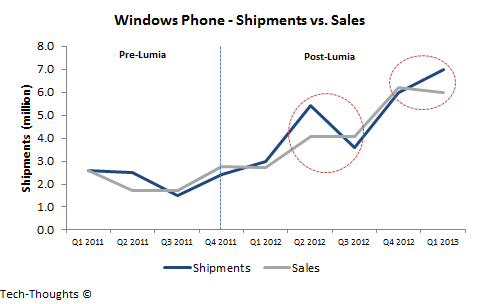 The chart above compares the shipments and sales pattern of Windows Phone/Mobile devices over the past two years. 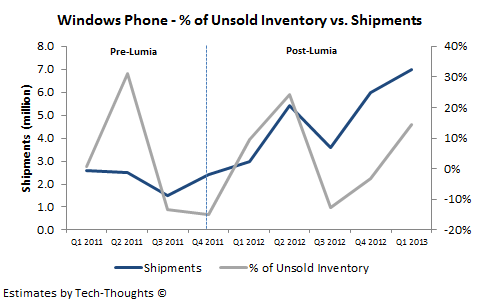 After Nokia's Lumia launch, the majority of shipments were of Windows Phone based devices. As the chart shows, Windows Phone has seen two inventory build-ups since the Lumia launch - The first was in mid-2012 after Microsoft announced that Windows Phone 7 devices were not forward compatible and the second was in Q1 2013. The sharp shipment boost in Q2 2012 saw limited growth in sell-through, which continued to be flat in the next quarter. This caused a sharp shipment decline in Q3 that hit Nokia hard. Compare this to the trend seen in Q4 2012 and Q1 2013 - Shipments saw sharp growth, but sell-through actually saw a slight decline. The chart above reinforces the point I've made above. Windows Phone's shipment growth over the past two quarters has been, at least partly, a result of a build-up in channel inventory. It's extremely unlikely for OEMs like HTC, Samsung or Huawei to be shipping large volumes of Windows Phone devices, which just leaves Nokia. In its Q1 filing, Nokia admitted that the channel inventory for its “Devices & Services” division (including both feature phones & smartphones) was above normal, while the inventory for “feature phones” had declined. Since Nokia’s feature phone shipments far outnumber its smartphone shipments, this implies that the inventory levels for Lumia smartphones saw large increases. Therefore, unless Nokia sees very strong growth in sell-through in Q2, they may find it extremely difficult to reach the targeted level of 7 million Lumia shipments. Considering slowing app growth on the Windows Phone platform, Nokia may have to resort to heavy price discounting to get closer to that figure.